Here come the posthumous Bowie auctions. 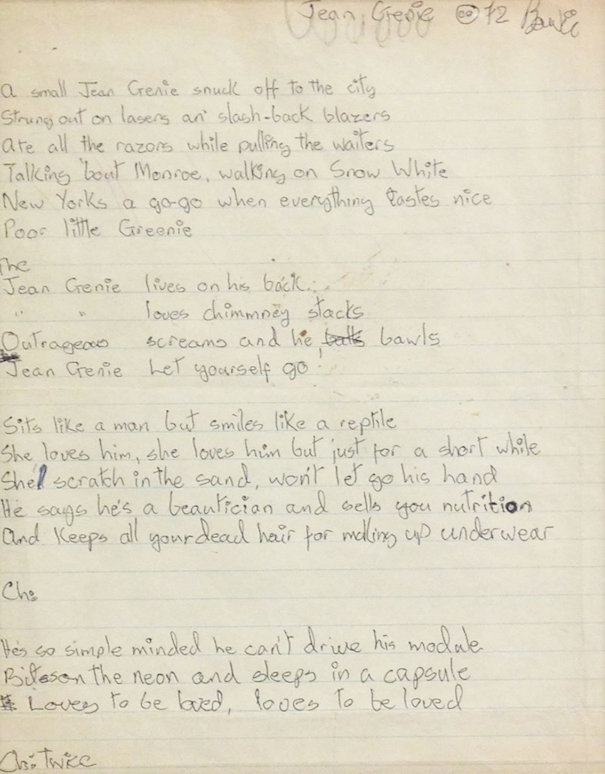 This one is especially capitalistic — a handwritten copy of 1972 Aladdin Sane gem “The Jean Genie,” bankrolled off previous investments at two separate sales, once in 2010 for $14k via Christie’s, and then in 2013 for $27k via Bonhams. Billed as the late Thin White Duke’s “only set of complete handwritten lyrics to have come to auction,” it’s new auction house, Paddle8, expects the 18 lines to go for $50-$70k. The best part, is that the lyrics at some point in their life were gifted to Neal Peters, the once President of the Original David Bowie Fan Club, by Bowie himself, of which Peters honorably sold at the Bonhams auction for charity. And because capitalism is so great, someone can make their money back and void all the good karma Bowie, and his number one fan, attempted to bring into the world.